Hello and welcome back to Early Bird Breakdown. It’s the final week of the regular season and the Packers’ last game as they will sadly not be in the playoffs this year. Last week the Packers traveled to New York to face the Jets. Before going into this week’s match up we will take a look back at the recap. For most of the game, the Jets were playing for something to build on for next season and it looked like the Packers would once again lose on the road. Sam Darnold had a career day throwing for 341 yards and the Jets entered the fourth quarter with a 15 point lead. Aaron Rodgers however would not be denied, erasing that fourth quarter deficit and was masterful throwing for 442 yards and a pair of touchdowns in the game. The Packers were significantly bailed out by the refs as well, with 172 penalty yards against the Jets, leading to Jets Coach Todd Bowles exploding in the post game press conference in likely his last home game as the Jets head coach. This was the Packers’ first victory on the road this season, avoiding them becoming the first Green Bay team since 1958 to go an entire season without a road win. The Packers won in OT 44-38. Despite the overall record, the Lions defense has been pretty good this season, ranking 12th in total defense and held the Packers to 23* points the last time they played (the asterisk is for the four missed field goals Mason Crosby had which likely will not be repeated). Still, despite that a few things have changed since then. Since the coaching change, even after losing Aaron Jones to IR two weeks ago, Jamaal Williams has been running well for the Packers and the Packers are actually running the ball. The Lions gave up 5.5 and 5.7 yards per carry to Williams and Jones respectively in that game but we only ran with them a combined 13 times. The Packers will be more balanced and they will be better suited for consistent offense because of it. Second, Rodgers is much healthier now than he was then. The offense has been inspired to play better since the firing of McCarthy simply to not be blamed for this lost season instead. While the scheme issues are still apparent in the playbook, Rodgers is playing at a high level and getting young receivers Equanimeous St. Brown and Marquez Valdes-Scantling important reps, each with five receptions last week. St. Brown is unlikely to play due to a concussion, and with Davante Adams questionable with a knee injury, Valdes-Scantling will need to have a big day. The best word to describe the Lions offense lately would be anemic and that might be a polite way to put it. In the last five games the Lions have failed to reach 20 points and have averaged only 14.2 points per game. 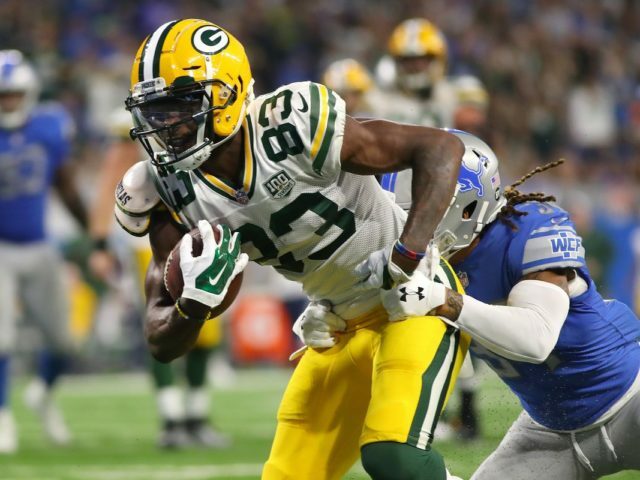 The Packers very well may be without emerging star corner Jaire Alexander who is questionable with a groin injury, but nothing the Lions have done lately should scare anyone offensively. The pass rush lead by Kenny Clark should reach home enough to fluster Matt Stafford, who is having his worst season since 2014. The weather will be partly cloudy and cool 31 degrees, however Matt Patricia has been having the Lions practice outside to simulate the temperatures so this is less help versus the normally dome playing Lions than usual. The Packers still have looked shaky in the last three games under Philbin despite the 2-1 record. They nearly lost to the Jets last week but face a similarly bad opponent in the Lions. Having said that, the Lions have more to gain by losing than the Packers do. With the Packers winning last week, they no longer can likely lose into a top 10 draft pick this week (based on standings and the games, a loss this week likely nets the 12th overall pick). Conversely, a win will drop the Packers all the way to 17th, which would then be too far back to likely trade up to get one of the premier defensive players in Nick Bosa, Devin White, or Rashan Gray that would have an immediate impact for the defense using only our two firsts to do so. The Lions meanwhile are in a five-way tie for the fifth overall pick. What does this mean for the players? Nothing, but it is food for thought for the fans and will impact potential injury decisions from the front office. In general though, I think the Packers players still want to make a post-McCarthy statement and the Lions look still lost under Matt Patricia. Green Bay likely takes care of things fairly easily, with the Packers winning 27-20 in a game that might not be that close for most of it. This entry was posted in Early Bird Breakdown, Stuart Weis and tagged Aaron Jones, Aaron Rodgers, Davante Adams, equanimeous st. brown, Green Bay Packers, Jaire Alexander, Jamaal Williams, Marquez Valdes-Scantling. Bookmark the permalink.